At the age of 14 I became interested in the hobby of Christmas Light Displays. The year was 1999 and we had just gotten internet at home the year prior. I had a pretty major surgery that caused me to miss a couple months of school, the school would send me work to make up, but I still had a good bit of free time while recovering. With all of that free time and having a natural tendency to be a nerd (my dad is a ham radio operator and has a degree in Electronics) I began using Netscape Composer to create some very rudimentary websites. The internet at this time was still in a pretty raw form with scrolling marquees and ugly gradients. I remember drawing up a sketch of a Santa parachuting down and how I could animate it with 3 or 4 scenes like you would see from the wireframes at Christmas Done Bright. I began searching the internet using Alta Vista to see if anyone else had done something similar. I came across a message board called Planet Christmas and stalked a whole community of people for a year before making my first post. I'm pretty sure at the time I was one of the youngest light hobbiest. I assure you it definitely wasn't something any of my peers were interested in haha. I also had an interest in doing garage haunts on Halloween and had been doing them for several years at this point. I knew there was a directory of Haunted Houses but I couldn't find one for Christmas Displays. I then created christmasdisplays.cjb.net, it was a free domain shortener and I hosted it on lycos' tripod. It was an ugly little website with a blue background and yellow snowflakes. 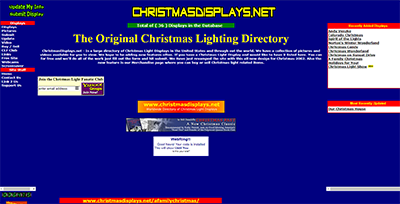 The following year I registered christmasdisplays.net and officially launched the original christmas light directory. The site has had ups and downs over the years and had various iterations. At one point people were snail mailing me their VHS tapes and I was using a convoluted way to digitize their videos and host them on the site. Please remember this was way before youtube and smartphones. I'm hoping to bring ChristmasDisplays.net back to it's glory days with tutorials, light displays and an overall great resource for the lighting hobbyist of today. I would really appreciate it if you would submit your display and join us over on our facebook group.